Shalini Sharma is microbiology Postgraduate from Maharaja Sayajirao University (MSU), Baroda. She is a Principal Scientist in Analytical Development Lab (Global Development) with the Biotech division of Intas Pharmaceuticals Ltd., and has more than 10 years of experience in the field of analytical method development and validation for biological drug products, which includes liquid chromatography methods, electrophoresis, ELISA and LC-MS. She has played key role in developing analytical methodologies and strategies, for establishing biosimilarity for EU and US registrations. Unlike small molecules, biological medicinal products are complex in nature. Despite the guidance from regulatory agencies like EMA and US-FDA, establishing analytical biosimilarity of a biological product with the reference product remains a challenge for analytical scientists, owing to the complex nature of biological medicinal products. Analytical similarity has gained more importance in recent years, since the analytical characterization data-package directly impacts the extent of clinical studies required to establish biosimilarity. The recent US-FDA draft guidance on establishing biosimilarity states the impact of the outcome of analytical similarity studies on biosimilar product development programme, wherein, based on the analytical biosimilarity results, the biosimilar product under development can be categorized as non-similar, similar, highly-similar and highly-similar with fingerprint like similarity. It further states that “The outcome of the comparative analytical characterization should inform the next steps in the demonstration of biosimilarity”. Considering these facts, demonstration of analytical biosimilarity becomes one of the most important aspects of biosimilar product development. An accurate and reliable analytical biosimilarity evaluation requires not only state-of-the art methods, but also an in-depth assessment of capability of analytical methodologies to detect minor differences between the biosimilar product and reference product. Employing methods like LC-MS, peptide-mass fingerprinting, circular dichroism, differential scanning calorimetry is imperative for structural evaluation during biosimilarity demonstration. Comparison of product related impurities in biosimilar product with the reference product can be particularly challenging, and needs to be evaluated using routine methods like reverse phase chromatography, SDS-PAGE etc, along with orthogonal high-end techniques like Analytical ultracentrifugation, SEC-MALS, CE-SDS etc. Identifying these impurities through LC-MS analysis, and comparing stability behaviors of both the products is also equally important. Choosing a set of right and useful analytical techniques is the key to successful demonstration of analytical biosimilarity, which can sufficiently support an abridged clinical trial, thus decreasing the cost of biosimilar development. - Analytical Method Development and Validation: Developing and validating analytical methods like high-pressure liquid chromatography, Size Exclusion Chromatography, Ion-Exchange Chromatography, Capillary Zone Electrophoresis, Electrophoresis, peptide mapping, ELISA, etc. for lot release, stability analysis and other in-process analysis. - Development of methods for characterization of glycosylation and methods for quantification of sugars and amino acid metabolites/additives in process. Specialties:Glycosylation characterization, protein structure analysis, impurity analysis and identification/characterization. Working on various aspects of product Biosimilarity. JemyRajanis a 4th year PharmD student, JSS College of Pharmacy, India. Biosimilars offer one way of widening access and enabling better value to be obtained from the money spent on health care. In some country such as South Korea, India and Brazil they are seen as a key macroeconomic driver of growth, attracting foreign capital by creating manufacturing and R&D centers of excellence.Countries around the world face a growing, aging population and an increase in chronic disease. With expanding demand for good-quality health care comes the challenge of controlling healthcare expenditure. The safe and regulated introduction of biosimilars into the market has been forecasted to increase access to much needed biologic medicines and reduce costs.The imperative to find cost-effective alternatives to biologic reflects the growing demand for these specialty drugs. Over the next few years, a new generation of complex biosimilars will be developed as numerous leading biologic medicines, worth an estimated $81 billion in global annual sales, will lose their patents by 2020. Fusion proteins and monoclonal antibodies used in cancer and autoimmune diseases are expected to form a substantial proportion of this new line of biosimilars.The biosimilars sector has reached very differentstages of evolution around the world.Clarity ofguidelines is variable and regulatory pathwaysdiverse, leading to various definitions ofbiosimilars across countries and regions. With patent expiration of innovative products, the biosimilars will increasingly become available. Awareness of the deviations between biosimilars and innovator products in terms of efficacy, safety and immunogenicity is essential for proper prescription and safety of the patients. 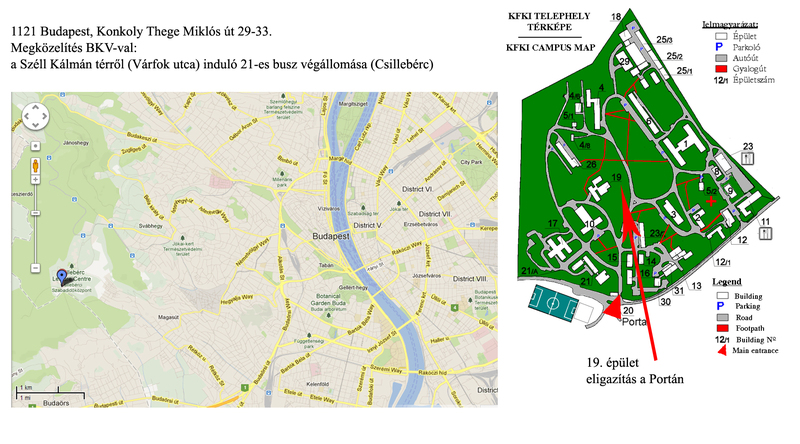 Location: KFKI Campus, H-1121 Budapest, Konkoly-Thege Miklós út 29-33. Budapest ( names in other languages) is the capital and the largest city of Hungary, and one of the largest cities in Central Europe. It is the countrys principal political, cultural, commercial, industrial, and transportation centre, sometimes described as the primate city of Hungary. In 2011, according to the census, Budapest had 1.74 million inhabitants, down from its 1989 peak of 2.1 million due to suburbanisation. The Budapest Metropolitan Area is home to 3.3 million people. The city covers an area of 525 square kilometres (202.7 sq mi). 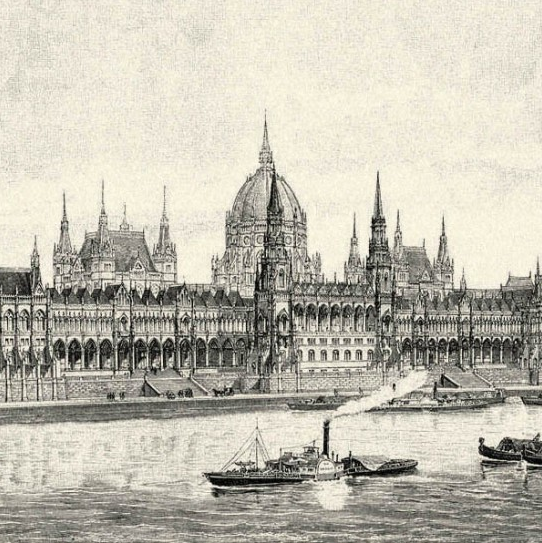 Budapest became a single city occupying both banks of the river Danube with its unification on 17 November 1873 of Buda and Óbuda, on the west bank, with Pest, on the east bank. The history of Budapest began with Aquincum, originally a Celtic settlement that became the Roman capital of Pannonia Inferior. Hungarians arrived in the territory in the 9th century. Their first settlement was pillaged by the Mongols in 1241–42. The re-established town became one of the centres of Renaissance humanist culture by the 15th century. Following the Battle of Mohács and nearly 150 years of Ottoman rule, the region entered a new age of prosperity in the 18th and 19th centuries, and Budapest became a global city after its unification in 1873. It also became the second capital of the Austro-Hungarian Empire, a great power that dissolved in 1918, following World War I. Budapest was the focal point of the Hungarian Revolution of 1848, the Hungarian Republic of Councils of 1919, Operation Panzerfaust in 1944, the Battle of Budapest in 1945, and the Revolution of 1956. Cited as one of the most beautiful cities in Europe, Budapests extensive World Heritage Site includes the banks of the Danube, the Buda Castle Quarter, Andrássy Avenue, Heroes Square and the Millennium Underground Railway, the second-oldest metro line in the world. It has around 80 geothermal springs, the worlds largest thermal water cave system, second largest synagogue, and third largest Parliament building. The city attracts about 4.4 million tourists a year, making it the 25th most popular city in the world, and the 6th in Europe, according to Euromonitor. Considered a financial hub in Central Europe, the city ranked third on Mastercards Emerging Markets Index, and ranked as the most liveable Central or Eastern European city on EIUs quality of life index. It is also ranked as "the worlds second best city" by Condé Nast Traveler, and "Europes 7th most idyllic place to live" by Forbes, It is the highest ranked Central/Eastern European city on Innovation Cities Top 100 index. Budapest is home to the headquarters of the European Institute of Innovation and Technology (EIT), and the first foreign office of the China Investment Promotion Agency (CIPA). Eighteen universities are situated in Budapest, including the Central European University, Eötvös Loránd University and the Budapest University of Technology and Economics. The first settlement on the territory of Budapest was built by Celts before 1 AD. It was later occupied by the Romans. The Roman settlement – Aquincum – became the main city of Pannonia Inferior in 106 AD. At first it was a military settlement and gradually the city raised around it becoming the focal point of the commercial life. Today this area correspond to the Óbuda district within Budapest. The Romans constructed roads, amphitheaters, baths and houses with heated floors in this fortified military camp. Acquincum is the foremost and best-conserved of the Roman sites in Hungary. The archaeological site was turned into a museum with inside and open-air section. The peace treaty of 829 added Pannonia to Bulgaria due to the victory of Bulgarian army of Omurtag over the Holy Roman Empire of Louis the Pious. Budapest arose out of two Bulgarian military frontiers, fortresses Buda and Pest, situated on the two banks of Danube. Hungarians led by Árpád settled in the territory at the end of the 9th century, and a century later officially founded the Kingdom of Hungary. Research places the probable residence of the Árpáds as an early place of central power near what became Budapest. The Tatar invasion in the 13th century quickly proved that defence is difficult on a plain. King Béla IV of Hungary therefore ordered the construction of reinforced stone walls around the towns and set his own royal palace on the top of the protecting hills of Buda. In 1361 it became the capital of Hungary. The cultural role of Buda was particularly significant during the reign of King Matthias Corvinus. The Italian Renaissance had a great influence on the city. His library, the Bibliotheca Corviniana, was Europes greatest collection of historical chronicles and philosophic and scientific works in the 15th century, and second only in size to the Vatican Library. After the foundation of the first Hungarian university in Pécs in 1367 (University of Pécs), the second one was established in Óbuda in 1395 (University of Óbuda). The first Hungarian book was printed in Buda in 1473. Buda had about 5,000 inhabitants around 1500. The Ottomans pillaged Buda in 1526, besieged it in 1529, and finally occupied it in 1541. The Turkish occupation lasted for more than 140 years. The Turks constructed many fine bathing facilities within the city. Some of the baths that the Turks erected during their occupation period are still in function after 500 years (Rudas Baths and Király Baths). Under Ottoman rule many Christians became Muslim. By 1547 the number of Christians was down to about a thousand, and by 1647 it had fallen to only about seventy. The unoccupied western part of the country became part of the Habsburg Empire as Royal Hungary. In 1686, two years after the unsuccessful siege of Buda, a renewed campaign was started to enter the Hungarian capital. This time, the Holy Leagues army was twice as large, containing over 74,000 men, including German, Croat, Dutch, Hungarian, English, Spanish, Czech, Italian, French, Burgundian, Danish and Swedish soldiers, along with other Europeans as volunteers, artillerymen, and officers, the Christian forces reconquered Buda, and in the next few years, all of the former Hungarian lands, except areas near Timi?oara (Temesvár), were taken from the Turks. In the 1699 Treaty of Karlowitz these territorial changes were officially recognised, and in 1718 the entire Kingdom of Hungary was removed from Ottoman rule. The city was destroyed during the battle. Hungary was then incorporated into the Habsburg Empire. The wide Danube was always fordable at this point because of a small number of islands in the middle of the river. The city has marked topographical contrasts: Buda is built on the higher river terraces and hills of the western side, while the considerably larger Pest spreads out on a flat and featureless sand plain on the river’s opposite bank. Pests terrain rises with a slight eastward gradient, so the easternmost parts of the city lie at the same altitude as Budas smallest hills, notably Gellért Hill and Castle Hill. The Buda hills consist mainly of limestone and dolomite, the water created speleothems, the most famous ones being the Pálvölgyi cave (total length 7200 m) and the Szeml?hegyi cave (total length 2200 m). The hills were formed in the Triassic Period. 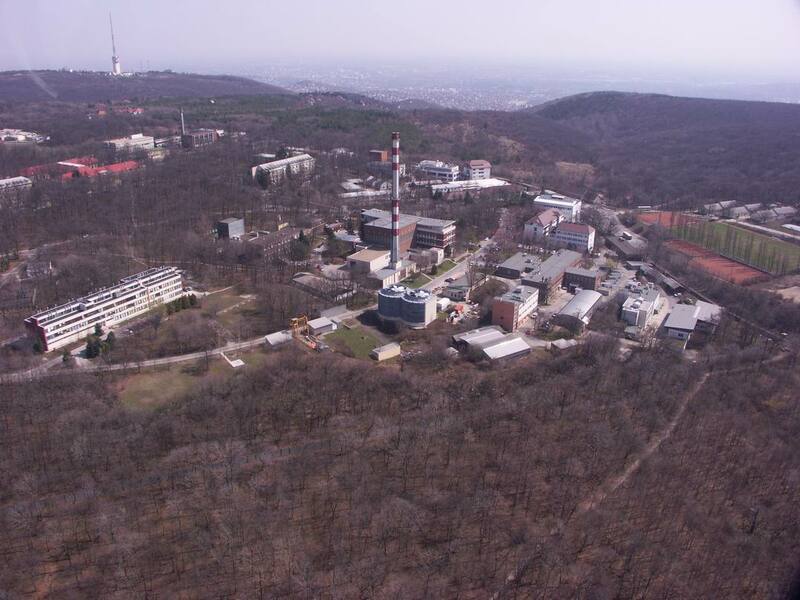 The highest point of the hills and of Budapest is János hill, at 527 metres (1,729 ft) above sea level. The lowest point is the line of the Danube which is 96 metres (315 ft) above sea level. 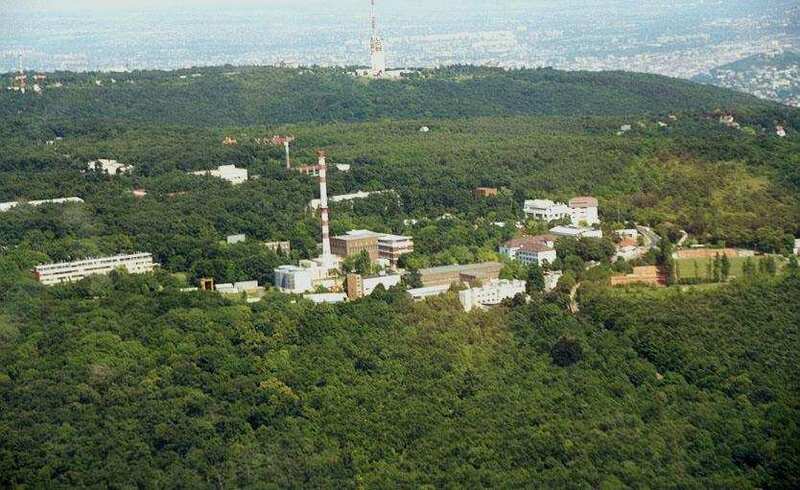 Budapest is also rich in green areas. Of the 525 square kilometres (203 sq mi) occupied by the city, 83 square kilometres (32 sq mi) is green area, park and forest. The forests of Buda hills are environmentally protected. 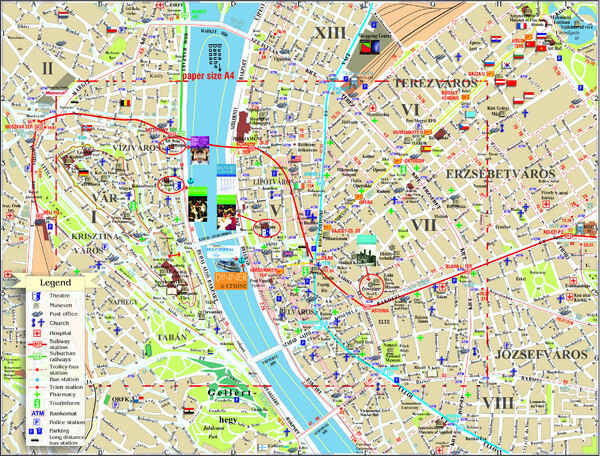 The citys importance in terms of traffic is very central, because all major European roads and European railway lines lead to Budapest. The Danube was and is still an important water-way and this region in the centre of the Carpathian Basin lies at the cross-roads of trade routes. Budapest is the only capital city in the world which has thermal springs. Some 125 springs produce 70 million litres of thermal water a day, with temperatures ranging up to 58 Celsius. Some of these waters have medicinal effects due to their medically valuable mineral contents. The 525 square kilometres (203 sq mi) area of Budapest lies in Central Hungary surrounded by settlements of the agglomeration in Pest county. The capital extends 25 and 29 km (16 and 18 mi) in the north-south, east-west direction respectively. The Danube enters the city from the north; later it encircles two islands, Óbuda Island and Margaret Island. The third island Csepel Island is the largest of the Budapest Danube islands, however only its northernmost tip is within city limits. The river that separates the two parts of the city is 230 m (755 ft) wide at its narrowest point in Budapest. Pest lies on the flat terrain of the Great Plain while Buda is rather hilly. Budapest is a significant economic hub, classified as an Alpha- World city (known as "major world city") in the study of Globalization and World Cities Research Network. On national level Budapest is definitely primate city of Hungary regarding the economy and business also, accounts for 39% of the national income. Budapest had a gross metropolitan product of almost $100 billion in 2012, making it one of the largest regional economy in the European Union. According to the Eurostat GDP per capita in purchasing power parity is 147% of the EU average in Budapest, which means €37.632 ($52.770) per capita. Budapest is also among the Top 100 GDP performing cities in the world, measured by PricewaterhouseCoopers. The neo-Gothic Parliament, the biggest building in Hungary with its 268 metres (879 ft) length, containing amongst other things the Hungarian Crown Jewels. Saint Stephens Basilica, where the Holy Right Hand of the founder of Hungary, King Saint Stephen is on display. The Hungarian cuisine and café culture: for example, Gerbeaud Café, and the Százéves, Biarritz, Fortuna, Alabárdos, Arany Szarvas, Kárpátia and the world famous Mátyás Pince Restaurants. There are Roman remains at the Aquincum Museum, and historic furniture at the Nagytétény Castle Museum, just 2 out of 223 museums in Budapest. Another historical museum is the House of Terror, hosted in the building that was the venue of the Nazi Headquarters. The Castle Hill, the River Danube embankments and the whole of Andrássy út have been officially recognized as UNESCO World Heritage Sites. Castle Hill and the Castle District; there are three churches here, six museums, and a host of interesting buildings, streets and squares. The former Royal Palace is one of the symbols of Hungary – and has been the scene of battles and wars ever since the 13th century. Nowadays it houses two impressive museums and the National Széchenyi Library. The nearby Sándor Palace contains the offices and official residence of the President of Hungary. The seven-hundred year-old Matthias Church is one of the jewels of Budapest, it is in neo-Gothic style, decorated with coloured shingles and elegant pinnacles. Next to it is an equestrian statue of the first king of Hungary, King Saint Stephen, and behind that is the Fishermans Bastion, built in 1905 by the architect Frigyes Schulek, the Fishermens Bastions owes its name to the namesake corporation that during the Middle Ages was responsible of the defence of this part of ramparts, from where opens out a panoramic view of the whole city. Statues of the Turul, the mythical guardian bird of Hungary, can be found in both the Castle District and the Twelfth District. In Pest, arguably the most important sight is Andrássy út. This Avenue is an elegant 2.5 km (2 mi) long tree-lined street that covers the distance from Deák Ferenc tér to the Heroes Square. On this Avenue overlook many important sites. It is a UNESCO World Heritage Site. 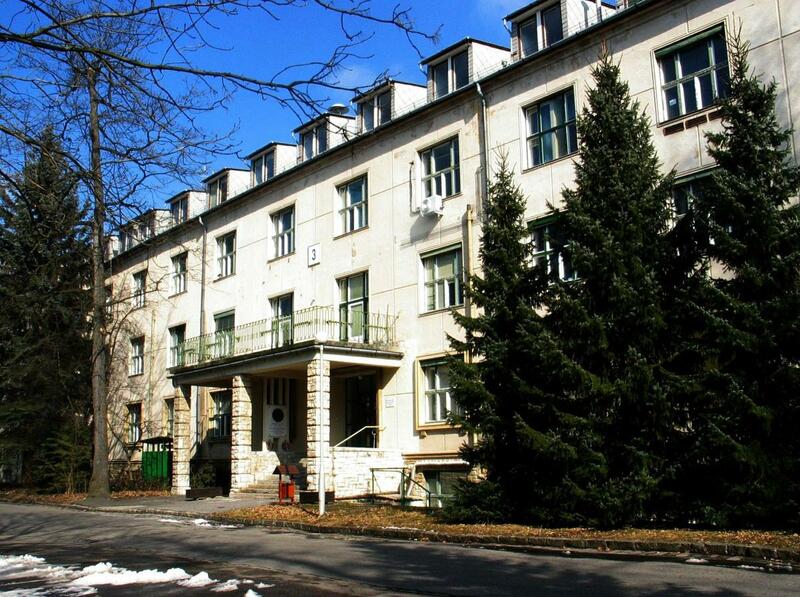 As far as Kodály körönd and Oktogon both sides are lined with large shops and flats built close together. Between there and Heroes Square the houses are detached and altogether grander. Under the whole runs continental Europes oldest Underground railway, most of whose stations retain their original appearance. Heroes Square is dominated by the Millenary Monument, with the Tomb of the Unknown Soldier in front. To the sides are the Museum of Fine Arts and the Kunsthalle Budapest, and behind City Park opens out, with Vajdahunyad Castle. One of the jewels of Andrássy út is the Hungarian State Opera House. Statue Park, a theme park with striking statues of the Communist era, is located just outside the main city and is accessible by public transport. The Dohány Street Synagogue is the largest synagogue in Europe, and the second largest active synagogue in the world. The synagogue is located in the Jewish district taking up several blocks in central Budapest bordered by Király utca, Wesselényi utca, Grand Boulevard and Bajcsy Zsilinszky road. It was built in moorish revival style in 1859 and has a capacity of 3000 people. Adjacent to it is a sculpture reproducing a weeping willow tree in steel to commemorate the Hungarian victims of the Holocaust. The city is also home to the largest medicinal bath in Europe (Széchenyi Medicinal Bath) and the third largest Parliament building in the world, once the largest in the world. Other attractions are the bridges of the capital. Seven bridges provide crossings over the Danube, and from north to south are: the Árpád Bridge (built in 1950 at the north of Margaret Island); the Margaret Bridge (built in 1901, destroyed during the war by an explosion and then rebuilt in 1948); the Chain Bridge (built in 1849, destroyed during the II World War and the rebuilt in 1949); the Elisabeth Bridge (completed in 1903 and dedicated to the murdered Queen Elisabeth, it was destroyed by the Germans during the war and rebuilt in 1964); the Liberty Bridge (opened in 1896 and rebuilt in 1989 in Art Nouveau style); the Pet?fi Bridge (completed in 1937, destroyed during the war and rebuilt in 1952); the Rákóczi Bridge (completed in 1995). Most remarkable for their beauty are the Margaret bridge, the Chain bridge and the Liberty bridge. The worlds largest panorama photograph was created in (and of) Budapest in 2010. Tourists visiting Budapest can receive free maps and information from the nonprofit Budapest Festival and Tourism Center at its info-points. The info centers also offer the Budapest Card which allows free public transit and discounts for several museums, restaurants and other places of interest. Cards are available for 24, 48 or 72-hour durations. The city is also well known for its ruin bars both day and night. The culture of Budapest is reflected by Budapests size and variety. Most Hungarian cultural movements first emerged in the city. Budapest is an important center for music, film, theatre, dance and visual art. Artists have been drawn into the city by opportunity, as the city government funds the arts with adequate financial resources. A lot of libraries have unique collections in Budapest, such as the National Széchenyi Library, which keeps historical relics from the age before the printing of books. The Metropolitan Szabó Ervin Library plays an important role in the general education of the capitals population. Other libraries: The Library of the Hungarian Academy of Sciences, Eötvös University Library, the Parliamentary Library and the National Library of Foreign Literature. There are many symphony orchestras in Budapest with the Budapest Philharmonic Orchestra being preeminent orchestras. It was founded in 1853 by Ferenc Erkel and still presents regular concerts in the Hungarian State Opera House and National Theatre. In the modern age, Budapest developed its own peculiar cuisine, based on products of the nearby region, as lamb, pork and vegetables special in the region. Modern Hungarian cuisine is a synthesis of ancient Asiatic components mixed with French, Germanic, Italian, and Slavic elements. The food of Hungary can be considered a melting pot of the continent, with a culinary base formed from its own, original Magyar cuisine. Considerable numbers of Saxons, Armenians, Italians, Jews and Serbs settled in the Hungarian basin and in Transylvania, also contributing with different new dishes. Elements of ancient Turkish cuisine were adopted during the Ottoman era, in the form of sweets (for example different nougats, like white nougat called törökméz, quince (birsalma), Turkish delight), Turkish coffee or rice dishes like pilaf, meat and vegetable dishes like the eggplant, used in eggplant salads and appetizers, stuffed peppers and stuffed cabbage called töltött káposzta. 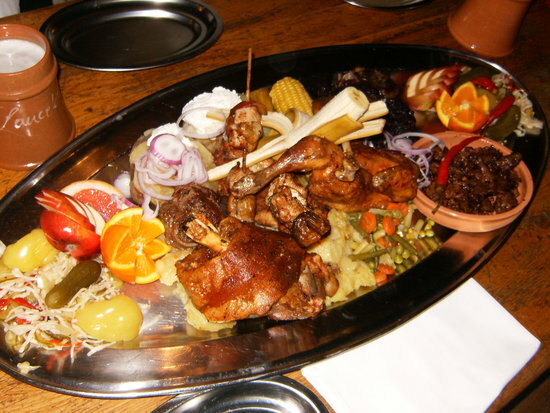 Hungarian cuisine was influenced by Austrian cuisine under the Austro-Hungarian Empire, dishes and methods of food preparation have often been borrowed from Austrian cuisine, and vice versa. Budapest restaurants reflect diversity, with menus carrying traditional regional cuisine, fusions of various culinary influences, or innovating in the leading edge of new techniques. Budapest food shops also have a solid reputation for supplying quality specialised culinary products and supplies, reputations that are often built up over generations. These include many shops, such as Café Gerbeaud, one of the greatest and most traditional coffeehouses in Europe, or the Gundel restaurant and gastro shop in the City Park. Diners can also find the highest quality foods served in several Michelin-starred restaurants, like Onyx, Costes or Borkonyha.